Physicist Hui Chen sets up targets for the anti-matter experiment at the Jupiter laser facility. (PhysOrg.com) -- Take a gold sample the size of the head of a push pin, shoot a laser through it, and suddenly more than 100 billion particles of anti-matter appear. The anti-matter, also known as positrons, shoots out of the target in a cone-shaped plasma "jet." This new ability to create a large number of positrons in a small laboratory opens the door to several fresh avenues of anti-matter research, including an understanding of the physics underlying various astrophysical phenomena such as black holes and gamma ray bursts. Anti-matter research also could reveal why more matter than anti-matter survived the Big Bang at the start of the universe. "We've detected far more anti-matter than anyone else has ever measured in a laser experiment," said Hui Chen, a Livermore researcher who led the experiment. "We've demonstrated the creation of a significant number of positrons using a short-pulse laser." Chen and her colleagues used a short, ultra-intense laser to irradiate a millimeter-thick gold target. "Previously, we concentrated on making positrons using paper-thin targets," said Scott Wilks, who designed and modeled the experiment using computer codes. "But recent simulations showed that millimeter-thick gold would produce far more positrons. We were very excited to see so many of them." In the experiment, the laser ionizes and accelerates electrons, which are driven right through the gold target. On their way, the electrons interact with the gold nuclei, which serve as a catalyst to create positrons. The electrons give off packets of pure energy, which decays into matter and anti-matter, following the predictions by Einstein's famous equation that relates matter and energy. By concentrating the energy in space and time, the laser produces positrons more rapidly and in greater density than ever before in the laboratory. "By creating this much anti-matter, we can study in more detail whether anti-matter really is just like matter, and perhaps gain more clues as to why the universe we see has more matter than anti-matter," said Peter Beiersdorfer, a lead Livermore physicist working with Chen. Particles of anti-matter are almost immediately annihilated by contact with normal matter, and converted to pure energy (gamma rays). There is considerable speculation as to why the observable universe is apparently almost entirely matter, whether other places are almost entirely anti-matter, and what might be possible if anti-matter could be harnessed. Normal matter and anti-matter are thought to have been in balance in the very early universe, but due to an "asymmetry" the anti-matter decayed or was annihilated, and today very little anti-matter is seen. Over the years, physicists have theorized about anti-matter, but it wasn't confirmed to exist experimentally until 1932. High-energy cosmic rays impacting Earth's atmosphere produce minute quantities of anti-matter in the resulting jets, and physicists have learned to produce modest amounts of anti-matter using traditional particle accelerators. Anti-matter similarly may be produced in regions like the center of the Milky Way and other galaxies, where very energetic celestial events occur. The presence of the resulting anti-matter is detectable by the gamma rays produced when positrons are destroyed when they come into contact with nearby matter. Laser production of anti-matter isn't entirely new either. Livermore researchers detected anti-matter about 10 years ago in experiments on the since-decommissioned Nova "petawatt" laser - about 100 particles. But with a better target and a more sensitive detector, this year's experiments directly detected more than 1 million particles. From that sample, the scientists infer that around 100 billion positron particles were produced in total. Until they annihilate, positrons (anti-electrons) behave much like electrons (just with an opposite charge), and that's how Chen and her colleagues detected them. They took a normal electron detector (a spectrometer) and equipped it to detect particles with opposite polarity as well. "We've entered a new era," Beiersdorfer said. "Now, that we've looked for it, it's almost like it hit us right on the head. We envision a center for antimatter research, using lasers as cheaper anti-matter factories." Chen will present her work at the American Physical Society's Division of Plasma Physics meeting Nov. 17-21 at the Hyatt Regency Reunion in Dallas. S.C. Wilks, E. Liang, J. Myatt, K. Cone ,L. Elberson, D.D. Meyerhofer, M. Schneider, R. Shepherd, D. Stafford, R. Tommasini, P. Beiersdorfer are the collaborators on this project. Finally!!! I am waiting on my antimatter rocket now! 10mg (0.01 grams) of this stuff equals in power to 23 space shuttle external tanks. I share your enthusiasm for an AM powered rocket, but unfortunately it's unlikely that such a thing would be built, even with the available technology. After all, we have nuclear power right now, which has an energy density ~1 million times greater than conventional rocket fuel, and we aren't using that either. NASA is utterly fixated on chemical fuel, and until that changes there will be little real progress in the field of human spaceflight. forget the B.F.G....A.M.H.G's (anti-matter-hand-gun)the new terrorist/zombie slaying machine. Laser, add some tiny gold pellets(ammo), you'll be turning the scariest zombies and monsters into gamma rays in no time! ..so, wait a minute there. Are you sh---ing me? You`re telling me the guys that wrote star trek were actually onto something? Quick! Maybe the Bussard Collector will work too! His Polywell IEC fusion prototype presumably generated extremely high neutron counts, readings which will hopefully be deemed correct and accurate by the review panel currently investigating Bussard`s claim that he has FOUND A WAY TO FUSION! don`t nobody get your hopes up about utilising antimatter engines.... perhaps this finding has reduced the amount of time needed to generate enough antimatter to get a ship to mars and back by 50 years, and perhaps the funds requires to do so will only half-bankrupt the US... and then theres the containment matter... we have to take baby steps, and until this technology is develpoed, and refined, we will just have to rely on Bussard``s polywell QED drive. Cheers! Human space exploration will continue to remain at a standstill until there is a concise way to unite the world in mutual efforts. Especially with the current economical problems, which show no end in near future its just too damn expensive. How about more money on space exploration and less money on killing people. We could use that 2 billion plus on every F-22 to fund more research such as anti matter engines or plasma applications. But thats just not how we roll. What about people who don't think like you Mynameisalex? Allow them to live? That's fine, but what about when they're sabotaging your efforts? People need to be evolved by example. That example being high power munitions by next-gen VTOL aircraft. Don't get me wrong, I'm with you 100%, unfortunately... Reality is a bigger challenge. Forget flying off into the next frontier, we need to meet the basic human necessities here on Earth for every person alive today: food, water, shelter and power. He was several orders of magnitude farther from break-even than either the ICF or tokamak approach. He believed that the scaling laws he derived from small scale experiment would extend to power levels millions of times higher; unlikely but not impossible. He believed he had solved the problems of brehmsstralung losses and losses from operating in a non-equilibrium state; that too is rather unlikely. The real mass of the electrons and positrons will just disappear and cause a minuscule gravity wave at their disappearance at most. Any motor working through and according to action is -reaction will just not work on relativistic impulse. I don't see how such a motor would work on electron-positron annihilation. Maybe anti proton annihilation might work, but where are the billions of anti protons? Soylent - lets just wait for the review panel`s verdict. As silly as you might think the polywell idea is, The US Navy extended the company`s contract by one year, with something like $2M to rebuild a vaporised prototype. That was over a year ago now. The new prototype is rebuilt, and the peer review was already done. I assume the company is most likely under an embargo(as they have been for the last 12 years...). If the thing did NOT work, we would have heard about it. If we do not hear anything of it in the next couple of months most likely it is successful but dont want to share the info with the world, makes sense, until they fully design a netpower device and build it. I think just a year ago creating this much antimatter in a lab would have been laughed at. Technology advances far faster than most people would expect; exponentially. Barriers that we create for ourselves, like heat dissipation on tiny scales and the generation of useful amounts of antimatter, are just that; barriers that we create for ourselves. All these problems have answers, we just have to discover them, and I bet we discover them far faster than would most. As long as everybody is working on something, and information is easily accessible, things will mesh and epiphanies and 'eureka!' moments will happen. Would a coloidal gold aerogel as a target work to produce a cascade reaction? The stuff that pops into my mind. 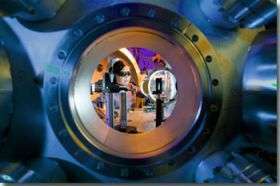 What direction relative to the laser do the anti electrons travel? What is the power of the laser? Can the cone be focused? Questions inquiring minds would like to know. 1.10*10^17 times in order to get your 10mg of antimatter. if you don't like exponents, thats 110000000000000000 times. "We could use that 2 billion plus on every F-22 to fund more research such as anti matter engines or plasma applications"
Raptors don't cost 2 billion. Each aircraft is only $361 mil. A drop in the bucket of the anual defence budget. Your thinking of the B-2 Spirit. I'm not even a scientist and I know to do my research. how much grams of antimatter did they create? "if you don't like exponents, thats 110000000000000000 times. (positrons, like electrons, have very little mass)"
That might be reasonable with 10-1,000,000 lasers firing constantly over the course of the acceleration periods. It would be less dangerous that way as well. No containment, just produce and annihilate. Is this the sort of process where enough excess energy is produced for them to make a g of acceleration while powering lasers that continue firing? If so, yay space travel! Though you'd have to be pretty dumb to travel through space, what with the black holes and immense amounts of radiation and all. I don't think it's silly. I just don't like people hyping the hell out of what is very much a long-shot(one of many I might add). [...]The US Navy extended the company`s contract by one year, with something like $2M to rebuild a vaporised prototype. Military money is notoriously stupid so that's not saying much. Ok. 10% of the ships mass is antimatter in a storage ring, or some futuristic equivalent. Like charges repell. It would be exceedingly difficult to have more than a miniscule amount of positrons stored that way. If you had access to anti-protons you could make electrically neutral anti-hydrogen; easier to achieve high density but I know of no mechanism that would contain it. A more realistic alternative in the short term is the Nuclear Salt Water Rocket. If you're not opposed to wasting perfectly good Highly Enriched Uranium or weapons grade plutonium left over from decommissioning of nuclear weapons you could make a NSWR that in prinicple could reach a few percent of lightspeed, accelerated by a continuous nuclear explosion(the waste products would have escape velocity from our solar system unless something goes spectacularly wrong). Mynameisalex, not to burst your bubble, but even if that money was spent on A-M research, it would still be "spending money on weapons." A-M devices would be very effective weapons. Enough that would power a space rocket could also power a low-yield tactical nuclear warhead. Instead of the annihilation of the fuel little by little to power a rocket, it would be annihilated all at once. Larger amounts of A-M would be able to produce weapons with larger yields. As for its use in weapons?! What is wrong with you people!!! Instead of considering the social value of a discovery, you immediately start wondering what kind of killing device you can create with it. This is sick! Generating that antimatter would naturally require energy, and if we were able to get enough energy on the ship we could use that for propulsion directly. There is absolutely no point in producing antimatter on the ship. If antimatter is ever used for propulsion, it will be generated beforehand and used as a fuel. Antimatter is the perfect energy storage - with the highest possible density.